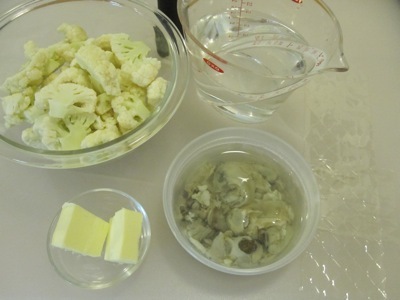 I started with eight ounces of cauliflower cut into florets, two tablespoons of butter, one and a half cups of water, a sheet of gelatin, and four oysters in their juice. I had my fishmonger shuck the oysters for me, since I was unwilling to learn that new skill on my tight schedule. 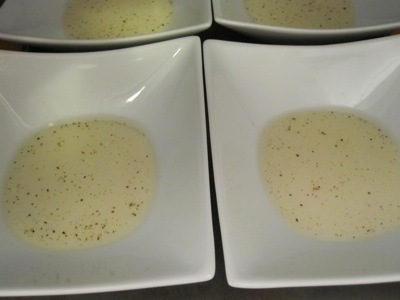 I added an additional quarter cup of water to the oysters and let them sit overnight to allow the water to infuse. 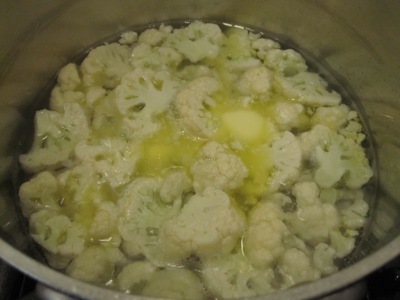 I added the cauliflower, water, and the butter to a saucepan and simmered until the liquid was almost gone, about thirty minutes. 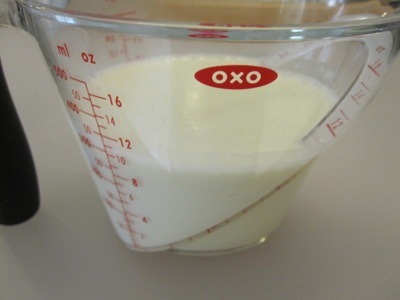 I then added a cup of heavy cream and cooked the mixture for another ten minutes. I blended the mixture in a food processor and passed it through a chinois to remove the cauliflower bits, which left me with about a cup and a half of purée, which I seasoned with salt. 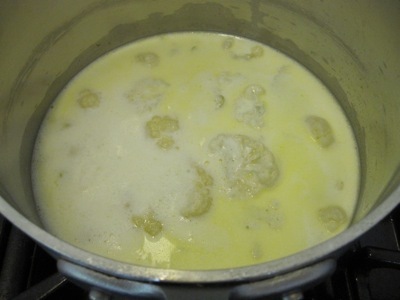 I removed and discarded the oysters (felling less guilty about tossing them than I would have if I had struggled to extract them from their shells), then strained the juice. 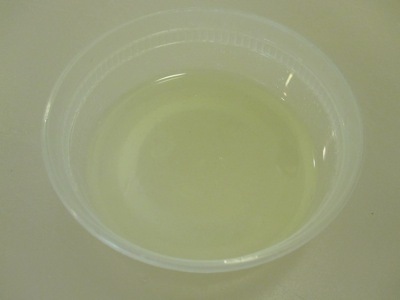 I dissolved an addition 1/3 sheet of gelatin in two tablespoons of hot water, then added the juice and a few grinds of black pepper before refrigerating the mixture. 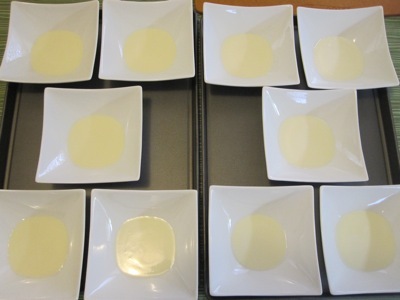 I stirred it every few minutes until it became viscous and the pepper remained suspended, then spooned two teaspoons of the gel over the top of the chilled panna cottas, tilting the bowls to make sure the gel evenly coated the entire surface. I returned the bowls to the fridge until it was serving time, then added a generous spoonful of caviar to the top of each bowl. Did I use beluga caviar? Hells no, I don’t have that kind of cash lying around. Besides, beluga is now officially banned as the product of an endangered species. Fortunately I live two blocks away from The Little Pearl, a local caviar purveyor, who provided an excellent American sturgeon substitute. 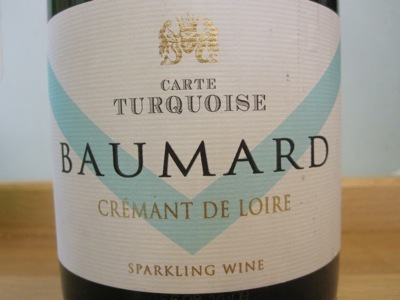 I served a Baumard Crémant de Loire in the place of a more traditional Champagne, and it matched the dish perfectly. How did it taste? 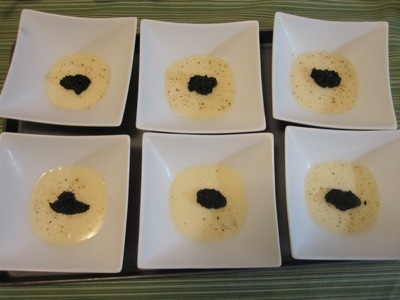 I was concerned that the cauliflower would overpower the other flavors, but instead it just added more depth to the creamy custard, the oyster gel contributed a note of brininess which boosted the flavor and the salty pop of the caviar. The dish was a certified plate-licker, a fine start to the rest of the meal.